Jessie fires off an energy orb. After hitting a target, the orb bounces at the next target in range, hitting up to three enemies. Jessie deploys a gun turret that automatically shoots at enemies. It’s made of 100% recycled materials! Annoying basic attack that bounces to the enemies nearby. Her turret provides insane damage output in some situations. Excellent at misdirecting the opponents. If you are a new players, spam her attack at the beginning because it’s likely the opponents always stay close together during the first few seconds of the match. That way it can hit up to 9 times in total. It is easier to dodge her Super Gun (Scrappy!) so it’s a must to place it next to the targets when they are on low HP. Placing Scrappy! in the bushes is also a great way to make the enemies off-guard. Remember, put it in the high traffic areas / bottle-neck to distract the enemy as much as possible. In Gem Grab, always place Scrappy! in the spawn area. In Heist, always place it next to the enemy Safe. 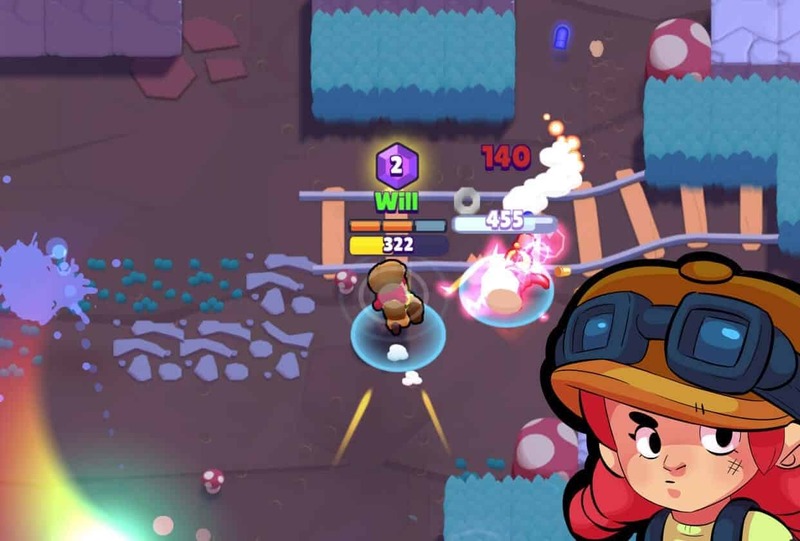 Jessie is so good in Brawl Ball because at the beginning, the enemies stay up close. Jessie is decent on solo kill. Place the Super on one side and target the enemy on one side. He/she have to attack either, not both at once. Practice to use her basic attack immediately when the enemies are up close. When the target is on low HP but there is another target next to it, attack the other target because the orb will bounce to the low-hp one. Don’t hesitate to throw the Super over the walls when your team want to take the control. Please do note that this guide is a bit obsolete. Jessie is the glass cannon with moderate health and somewhat high attack. She recently received an attack nerf but I believe she is still one of the best characters in the game. Her main role in a 3v3 is usually as a damage dealer. Her attack has one of the longest ranges in the game (just under Piper, but she hasn’t been released yet). Her primary attack can hit up to 3 units before dying or hitting a wall. This is a very annoying feature to play against. With 700 hitpoints, Jessie falls more on the squishy side. However, her attack makes up for this lack in HP. Her HP isn’t much to marvel about, though, so I’ll end this section right now. This attack is pretty strong. It is single shot but can hit up to 3 targets, which in my opinion, is one of the most useful things about her because if you hit one person, usually you’ll hit somebody else. It also has a very high range. The only downside is that it does not do as much damage compared to some of the other brawlers. This super is probably one of the best in the game. The gun turret has as much health as she does and shoots moderately quickly. I love this because it allows you to camp at the gem mine in Smash & Grab. It has other uses too. It saves your life in a dangerous situation sometimes and can also serve as a distraction. Try to stand as far as possible. Shelly’s shotgun does less damage the further you are, so snipe her. She is an easy matchup unless you get too close to her or she hides behind a wall. In confined spaces, you might need some support. Her super is annoying. If you get hit, run and hide until you regenerate more health. Colt is similar to Shelly but does the same amount of damage wherever you stand. His attack is pretty narrow, however, so keep moving while you’re shooting him. As long as you don’t stand in the middle of his super for a long time, you should be fine. Like Colt, but he only shoots one rocket at a time and they do more damage. If you don’t get hit, you should be fine. You have similar ranges so outranging him won’t work. It is actually easier to kill him if you stand near him as his attacks will miss you more often. His super covers a wider area. Try to run as soon as you see the first rocket emerge. This one comes down to whoever can be more unpredictable and whoever can predict their opponents better. Also, if you charge your super first, it can be very helpful as it is essentially a clone of yourself that doesn’t move. If she manages to spawn the turret before you, try to lead her away where her turret is out of range. Nita is an annoying one to deal with. If she’s by herself, try to outrange her and start sniping, which shouldn’t be too hard. However, the bear is an entirely different story. Also, try not to get too close. Instead, snipe her from a long distance. Her bear is the main threat. Ideally, you want to snipe both the bear and her from a long range. If you’re lucky and they’re standing close by, you may be able to hit both at once. Dynamike should be an easy matchup unless you are stuck behind a wall or something. You can try to chase him, but mainly, just stay out of his dynamite blast radius and you should be fine. If you are caught in the middle of his super, you might not be able to escape. However, you can almost always run away. The number 1 rule when dealing with El Primo is stay away from him. If you get within his punching radius, you’re almost certainly dead. Instead, keep your distance. If he uses his super and gets close to you, there is pretty much nothing you can do. Try to avoid this situation in the first place, or, if he’s on low health, just keep shooting him. Again, keep your distance. He has a longer range than El Primo, but not by much. I don’t have him yet (rip f2p players) so I haven’t gotten to play around with him, but unless you outrun him somehow, he will probably kill you eventually. Again, if he uses his super to get close to you, RUN. He only has 500 health, which makes him somewhat easier to kill. Watch out for his bouncing bullets, however. With your range, you can pretty much beat him easily in open spaces, but if he ducks behind a wall, try to get over the wall without getting hit. His super basically does the same thing as his regular attack except more damage. Like dynamike but with a bigger area splash. He should be easy to deal with unless you are stuck behind a wall or something. Tip: If you’re stuck behind a wall and have your super charged up, simply throw the turret on the other side. His super is extremely hard to dodge, so if it’s aimed at you, you’ll probably take some damage. Simply wait until you are healed and go for him again. If you are in a team match, target him first. His normal attack has a short range, so in an open area, you should be able to win easily. In confined spaces, you might need the help of a teammate or your turret to distract him while you kill him. His super is extremely annoying. If you are trading hits with him and he heals, RUN. First off, sniping him is NOT a good idea as he will simply get closer to you and kill you. Instead, either trade hits with him or get support. He is not too tanky so as long as you are wise you should be able to deal with him. His super is like Poco’s: If you’re trading hits, RUN. This is a hard one. You have about equal ranges but he shoots three arrows while you only have 1 ball. Try to dodge as many arrows as you can without missing him. His super can be annoying because once you see the mines, it’s probably too late. Just stay far from him. Spike is pretty hard to deal with. Unless you are extremely skilled, I would not recommend taking him 1 on 1. Instead, snipe him behind a tank like El Primo. Try not to get caught in his super. You will be very vulnerable if you are. Crow is also pretty hard to deal with. His poison daggers can be very hard to deal with. A tank can usually deal with him better than Jessie. His super is like El Primo’s: Try not to have him land on you. Wait what… I honestly don’t remember why I said 2nd. Did someone else’s get deleted? Nice guide. Personally, I find her super very irritating, but my super (Bo) kills her. Any android release date announced? y r the pictures so big?